Elia was born to Fulgenzio and Maria (DiStefano) Magaletti, on November 2, 1930, in Yonkers, NY. 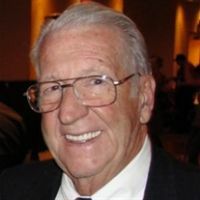 He is survived by his wife of 65 years, Josephine (Dâ€™Addario), and 4 sons and 1 daughter: Enzio & Amzell (Glendenning) of Tucson, AZ, Ted & Linda (Wind) of Evergreen CO, John Magaletti of Tucson, AZ, Joseph & Terri (Wind) of Thornwood, NY, and daughter, Marialuisa Oliva of Tucson, AZ. He is also survived by 5 grandsons, 6 granddaughters, 6 great-grandsons and 3 great-granddaughters. Elia retired from New York Central (Metro North) Railroad as an Electrical Substation Foreman after 39 years of service, relocating to Tucson in 1990. He was a long-time member of the Thornwood, NY, Volunteer Fire Department, a Fourth Degree Knight with the Knights of Columbus St. Martins de Porres Council #6848 and a member of the Italian American Club. He enjoyed fishing, bowling and bocce and was an active volunteer for the American Red Cross and many other local charities.